However, mosques are the Muslim place of worship, while temples or gurdwaras are used by Sikhs. 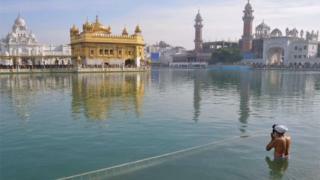 He later corrected himself saying he should have said "the Golden Temple or, better, Sri Harmandir Sahib." The Golden Temple, in the state of Punjab, is the chief place of pilgrimage for Sikhs and was built in the 16th century by the fourth Sikh guru, Ram Das. The Queen visited in 1997, 13 years after a deadly raid by the Indian army, one of the most controversial events in the country's recent history. According to the Indian government about 400 people were killed in 1984, but Sikh groups say thousands died. The tweet from Sir Simon, who is head of the diplomatic service, provoked anger among British Sikhs on social media. Jasvir Singh, the chair of the organisation City Sikhs said: "Sikhs often find themselves confused with Muslims, and there is an obvious need to improve faith literacy in British society generally. "However, it beggars belief that one of the most senior diplomats in the country could confuse the world famous gurdwara, known colloquially as the Golden Temple, for a mosque. It is embarrassing and inexcusable." Sir Simon has sent several tweets from a trip to the northern Indian city of Chandigarh, where he has been meeting politicians and students. The mosque tweet appears to be sent from a party to mark the Queen's birthday, at which the governor of the state of Punjab was also present. Meanwhile Dr Jasjit Singh, a researcher at Leeds University, asked whether Sir Simon had been thinking of a genuine Muslim place of worship called the Golden Mosque, which is in Rochdale.